SANTIAGO, Jun 13 2018 (IPS) - Consumers can be allies in curbing desertification in Latin America, where different initiatives are being promoted to curtail it, such as sustainable land management, progress towards neutrality in land degradation or the incorporation of the bioeconomy. Ecuador is cited as an example in the region of these policies, for its incentives for intelligent and healthy consumption and promotion of sustainable land use practices by producers and consumers. This is important because 47.5 percent of the territory of that South American country is facing desertification and the worst situation is along the central part of its Pacific shoreline. On Jun. 15, the second phase of a Sustainable Land Management (SLM) project, promoted by the United Nations Convention to Combat Desertification (UNCCD) and implemented by the Food and Agriculture Organization (FAO) and Ecuador’s Environment Ministry, will be launched with funding from South Korea. The plan promotes the strengthening of the capacity of communities affected by degradation. In the first phase 348,000 dollars were invested. “The project seeks to have pilot sites serve as a reference for communities to verify SLM efforts and their potential to adapt to local conditions,” he said. “It also seeks for these practices to have a landscape approach that integrates the management of remaining ecosystems and agricultural areas to maintain local environmental services in the long term, such as regulation of the hydrological cycle and sustainable land use,” he said. 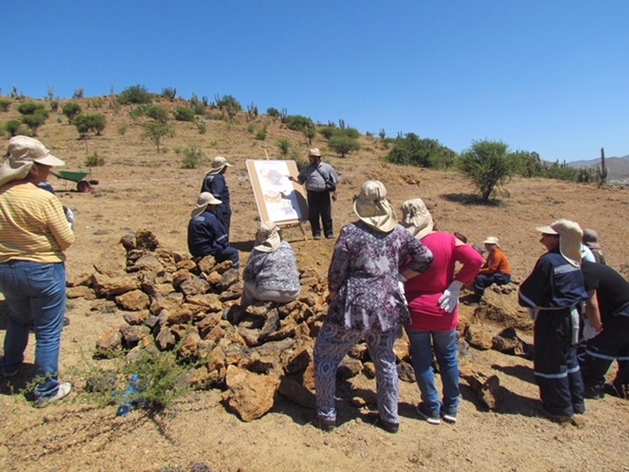 “Local farmers will be the direct stakeholders in the project since their involvement is a prerequisite for developing the different practices on their farms,” in a process which will use tools already tested by FAO and the results of the National Assessment of Land Degradation, carried out in the country in 2017. Ecuador is also the country that will host this year’s global observance of World Day to Combat Desertification, on Jun. 17. This year’s focus will be on the role of consumers on sustainable land management through their purchasing decisions and investments. Under the theme “Land has true value. Invest in it,” one of the objectives is to “encourage land users to make use of the land management practices that keep land productive,” said Monique Barbut, executive secretary of the UNCCD. Symbolically, the event will take place at the Middle of the World Monument, located exactly on the equator, from which the Andean country takes its name, about 35 km from Quito, to symbolise the union of the two hemispheres, the UNCCD coordinator for Latin America and the Caribbean, José Miguel Torrico, based in Santiago, Chile, told IPS. Ecuador’s commitment to innovative initiatives to combat soil degradation and to promote sustainable land management, which also include advances in the transition to a bioeconomy, is also recognised by its choice as host. Tarsicio Granizo, Ecuador’s environment minister, defined the bioeconomy as “an economic model based on renewable biological resources, replacing fossil resources,” which has special meaning in a country that has depended on oil exports for decades as one of the pillars of its economy. “Experts agree that this model combines economic progress with care for the environment and biodiversity,” Granizo said during the Second Global Bioeconomy Summit, held in Berlin in April. “On the other hand, the returns on investments in actions against degradation at the global level are four to six dollars for every dollar invested,” he said, explaining the benefits of mitigation projects. This also applies in Latin America and the Caribbean, where it is estimated that 50 percent of agricultural land could be affected by desertification. In this region, “13 percent of the population lives on degraded lands, which varies from country to country: in Uruguay 33 percent of the population lives in degraded areas, compared to just two percent of the population in Guyana,” said the UNCCD regional coordinator. “The annual costs of land degradation are estimated for Latin America and the Caribbean at 60 billion dollars per year, while globally they are estimated at 297 billion per year,” Torrico added. “In direct terms, 40 percent of the world’s population (more than 2.8 billion people) live in regions undergoing desertification, while around 900 million people lack access to safe water,” he said. “Estimates indicate that in order to supply the world population by 2050 (which is projected to reach nine billion people), agricultural production will have to increase by 70 percent worldwide and by 100 percent in developing countries,” he said. Otherwise, 1.8 billion people will be living in countries or regions with absolute water scarcity, and two-thirds of the world’s population (5.3 billion) could live under water stress conditions. This would mean that 135 million people would have to migrate by 2045, as a result of desertification,” he added. This strategy, he explained, “seeks to harmonize public policies to address this phenomenon. “The other emergency has to do with the fulfillment of the 2030 Agenda, where 26 countries in the region have established a programme of goals to achieve,” he said. This new commitment is that “what we take from the earth, we have to replace and maintain productivity,” Torrico concluded, on the commitment by its 195 States parties to achieve this neutrality by 2030, assumed in 2015 within the framework of the UNCCD.